Complete and balanced nutrition for full range of pond fish. Excellent for catfish, bluegill, minnows and carp. Multiple size particle - feeds all sizes of fish. Floating ration - great for viewing. Higher digestibility of nutrients. 32% high protein with attractant. Added Vitamin C to reduce deficiency-related problems. 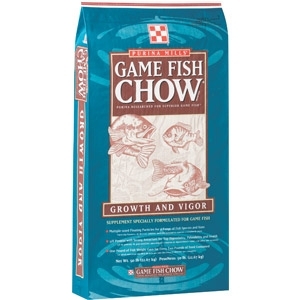 Enhances production of forage fish to enhance size and number of bass.